Good morning, my DIY crafters! Cutting Edge Stencils loves a thrifty craft project, don’t you? 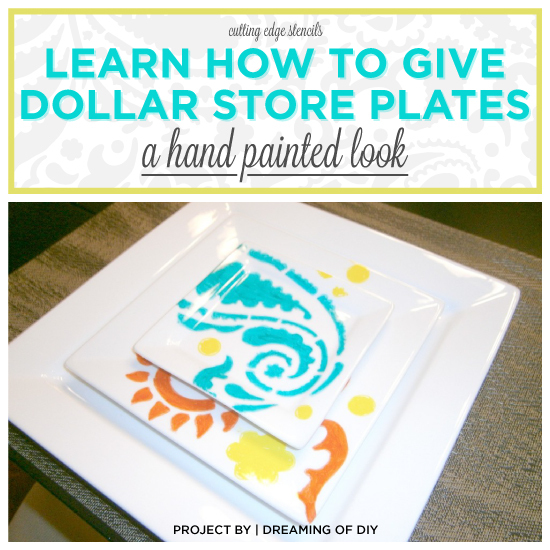 Beautiful hand painted plates can be very expensive. 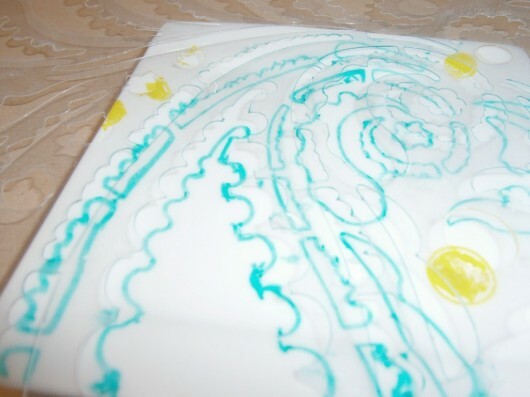 That’s why we love the idea of giving inexpensive white dinner plates a high-end, custom look with a stenciled design. We’d like to introduce Kathleen, the DIYer and blogger behind Dreaming of DIY. Kathleen had been trying to find accent plates to use on her table during non-holiday times. She wanted something that had a pop of color and a pretty Paisley pattern but didn’t cost her a fortune. After searching high and low for orange plates with a paisley pattern, her DIY light bulb went off. Kathleen decided to make them herself using a stencil and colored sharpies. She had our beautiful Paisley Allover Stencil from a previous project and decided to reuse it for this one. Here’s how it all turned out. 1. Gather Materials: Start the stencil project by gathering all of the materials listed above. 2. Secure The Stencil: Clean the plate really well before you begin stenciling. 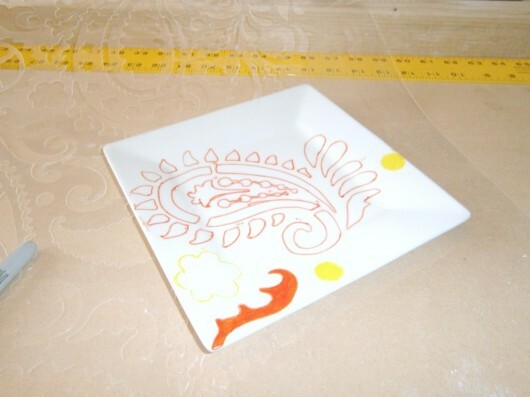 Then position the stencil design on the plate and secure it in place using painter’s tape. 3. 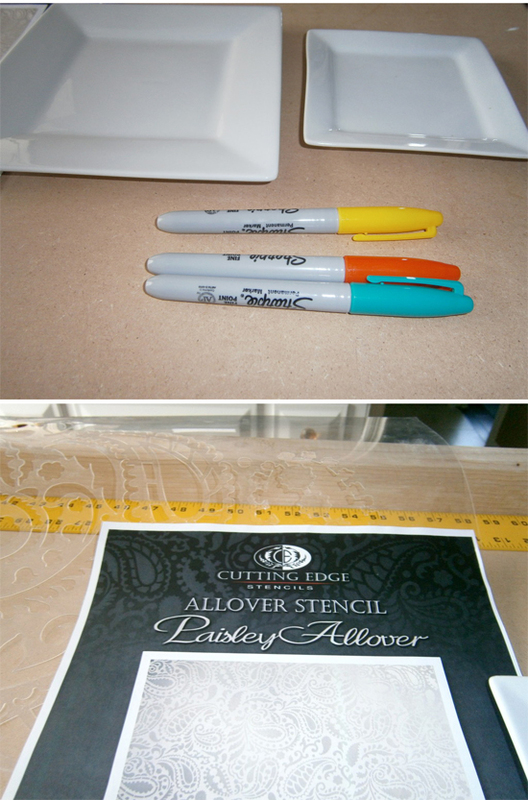 Start Tracing the Stencil: After you place the stencil on the plate, you’re ready to begin stenciling! 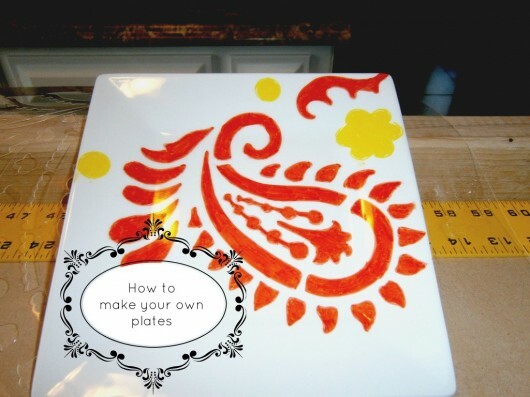 Use a colored Sharpie to trace the design onto the plate. 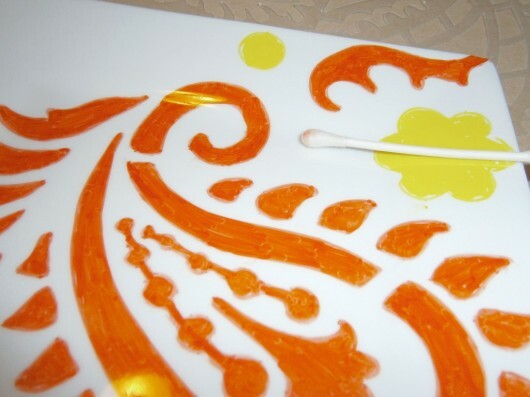 In the image below, Kathleen used an orange Sharpie to outline the paisley pattern. 4. Fill in the Pattern: Once the stencil has been outlined, now it’s time to fill in the pattern with the Sharpie. 5. Heat Set the Design: Set your oven for 350 degrees and bake them for 30 minutes. This will make the design permanent so that you can eat off of them. 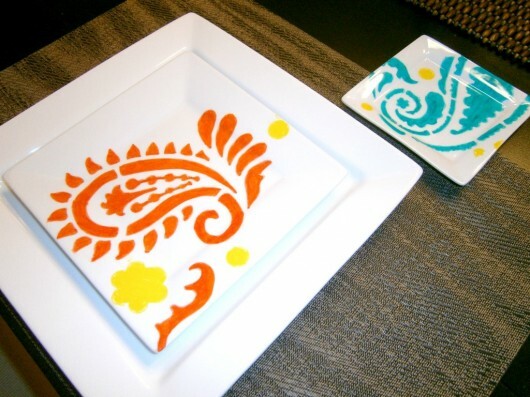 What do you think of these Paisley stenciled plates? We’d love to read your thoughts, so leave us a comment below! Shop our stencil collections on the Cutting Edge Stencils website! ‘Fan’tastic Stenciled Projects of the Week!